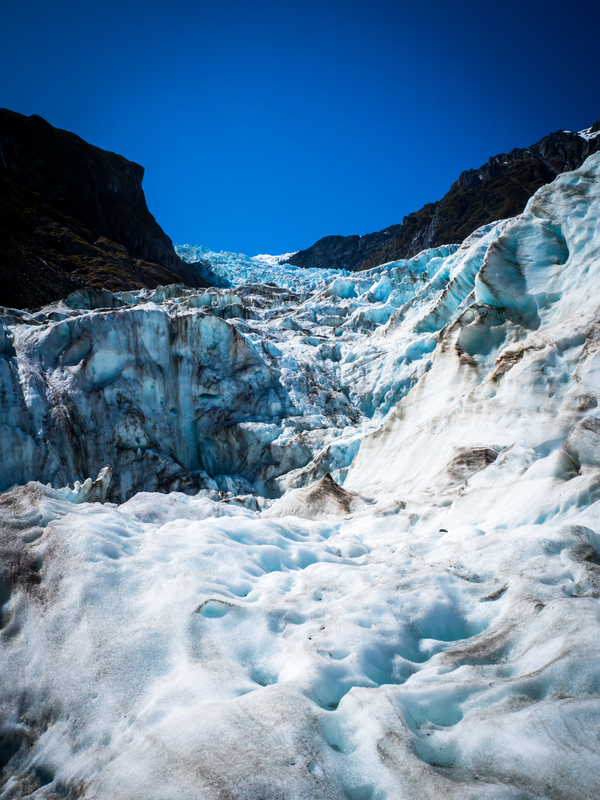 The Fox Glacier sits within the Southern Alps on New Zealand West Coast. From it’s nevé plummets steeply towards its terminal face, dropping 2,600m over 13 kilometres. 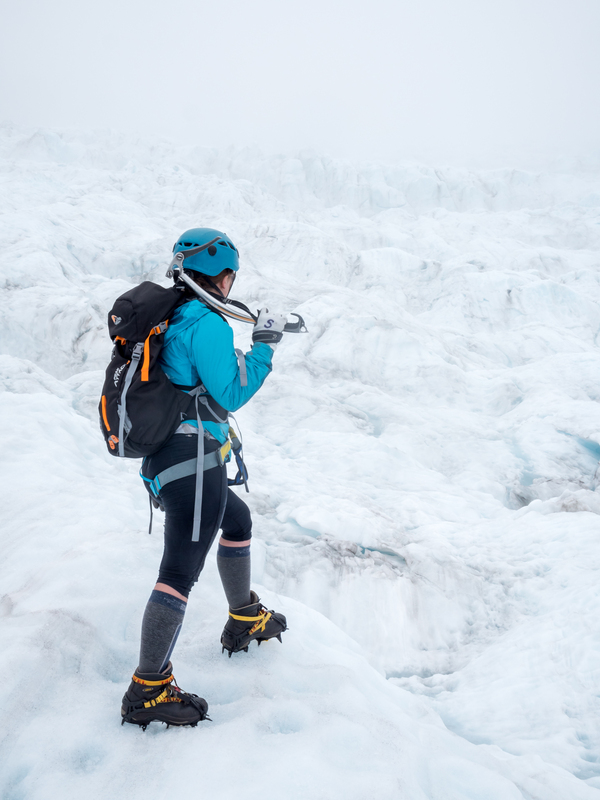 This steep incline means that the glacier is incredibly fast moving, covering up to 5m in a single day – distances other glaciers struggle to reach in a year. 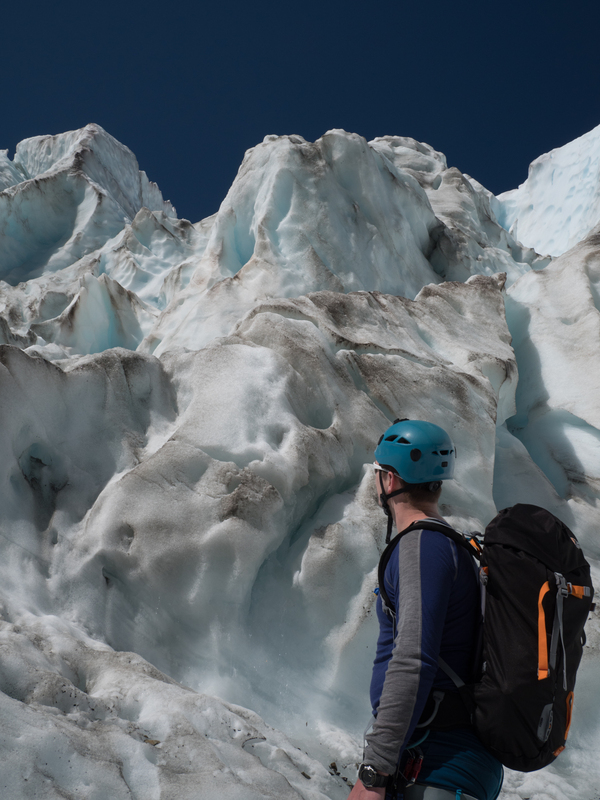 The fast pace of the glacier and the amount of ice forced into the valley from the nevé means that features such as ice caves, pressure ridges are often seen. Its Maori name, Te Moeka o Tuawe, means the final resting place of the ancestor Tuawe. 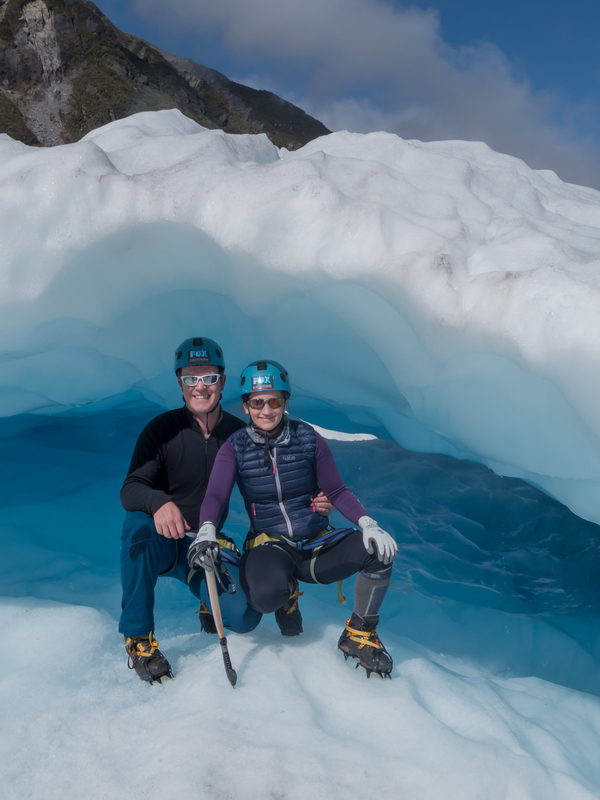 He fell to his death whilst exploring the area, and his lover Hine Hukatere wept tears which formed the nearby Franz Joseph Glacier – also know as Kia Roimata o Hine Hukatere. Both glaciers are also unique because they end amidst rain forest which is considered unusual. 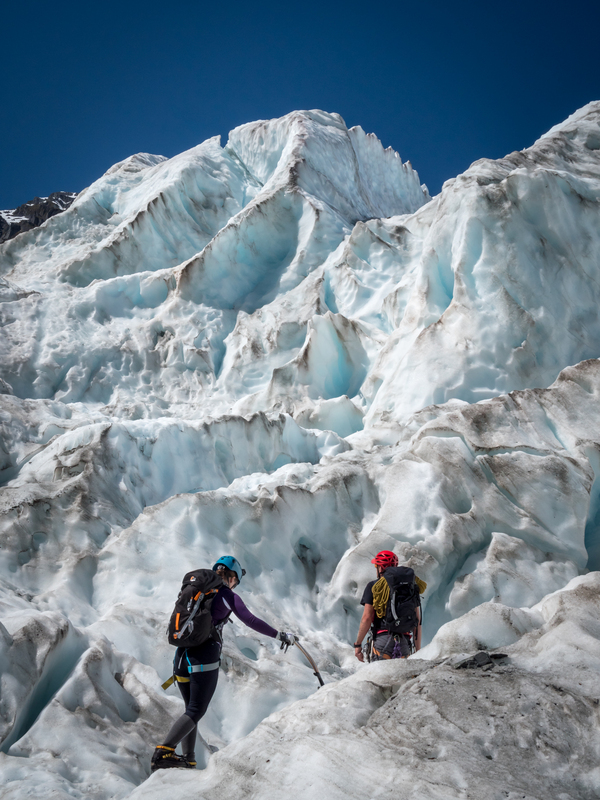 In recent years the glaciers in this region have begun to retreat, meaning hiking onto the ice from the terminal face is not safe, and instead tourists must be flown up onto the glacier itself. 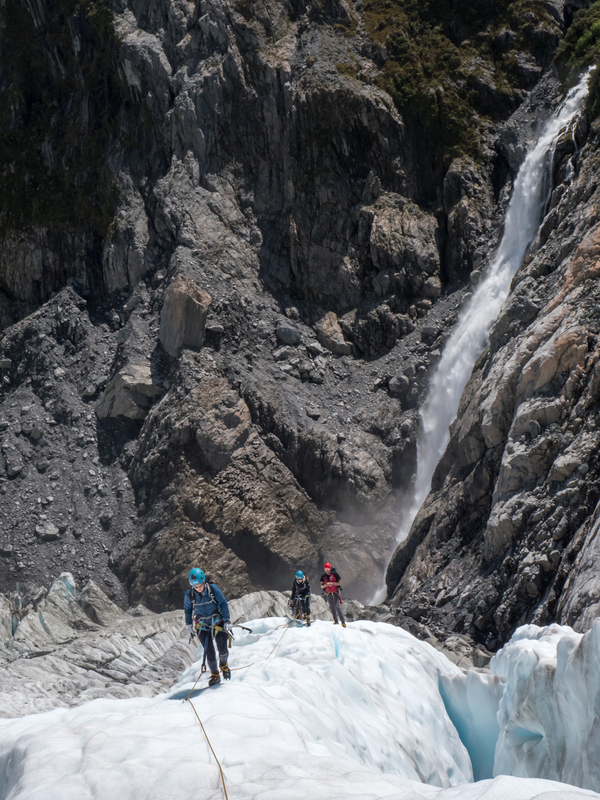 Despite this, it is one of the most accessible glaciers in the world, and local company Fox Glacier Guiding, takes several hundred people up onto the face each day. Our day started back in the valley, where we were introduced to our fellow explorers and our guide Cam. 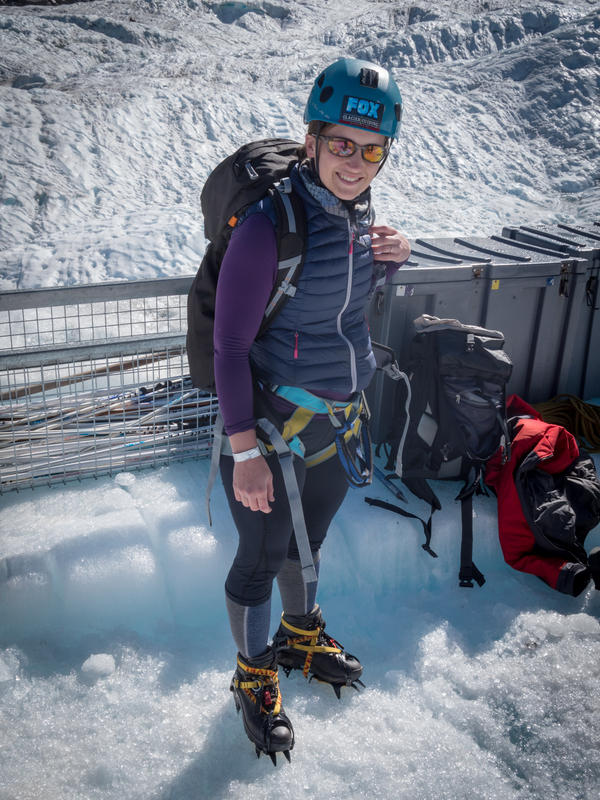 We made our way steadily through the kitting out process – although you can bring your own equipment, the company has good quality kit and it is better to get their kit wet than your own! After a quick safety briefing, we hopped on a bus for the short journey to the heli pads. As we were going to be on the ice for up to six hours we had been issued with a lunch voucher, which was exchanged for food in the hobnail cafe. The voucher gives a very generous amount of food and we had safely stowed two sandwiches, a sausage roll, muffin and large cookie into our bags, in addition to our ice axe and crampons. Once aboard the helicopter we were treated to the magnificent views of the glacier and surrounds, before setting down on the lower of the companies two heli pads. Geared up and ready to go we watched the helicopter disappear back to base before heading out onto the ice. The first part of the day was geared towards mastering the technique of walking on ice. 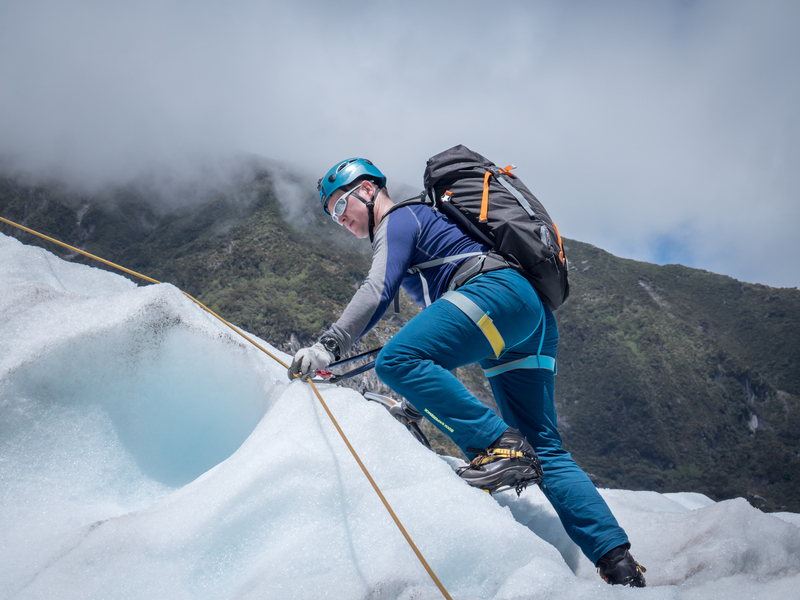 The crampons provide an incredible amount of extra grip, walking up and down steep inclines is little trouble, provided crampons are placed correctly. As our confidence built so did the day, living up to its “extreme” title. 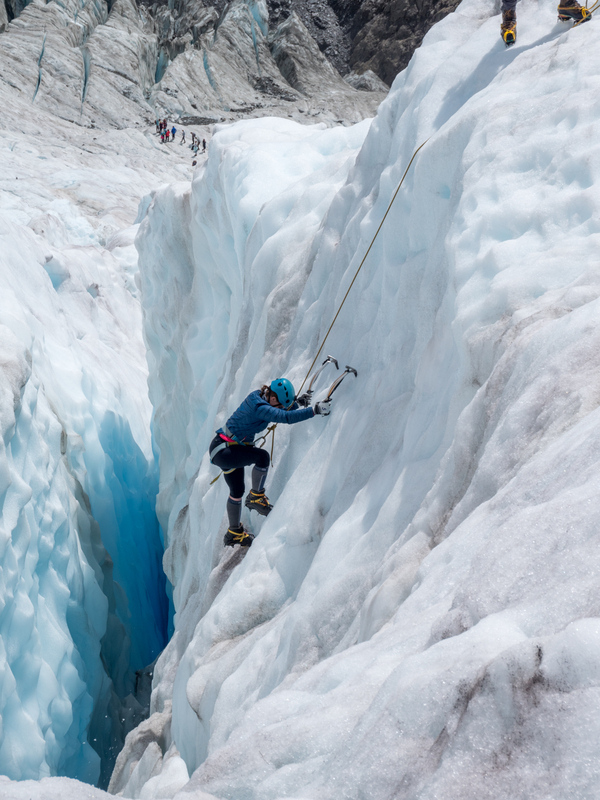 We climbed ice faces of increasing difficulty, were lowered into a crevasse, slid through an ice cave and traversed a bridge between two crevasses using a via ferrata system. This was all set up by our guide who nimbly ran ahead to set up ropes and belay systems . This ensured we were safe, whilst providing us with stunning views and incredible experiences. Sadly, the weather seemed to match the increasing difficulty of our day. As we made our way up the glacier the clouds began to roll in, creating a much more threatening view of the glacier than the picturesque view we had been presented a few hours earlier! Our guide kept a close watch on this and when the fog continued to lower, rather than clearing as hoped, we headed towards the upper heli pad for an off lift. 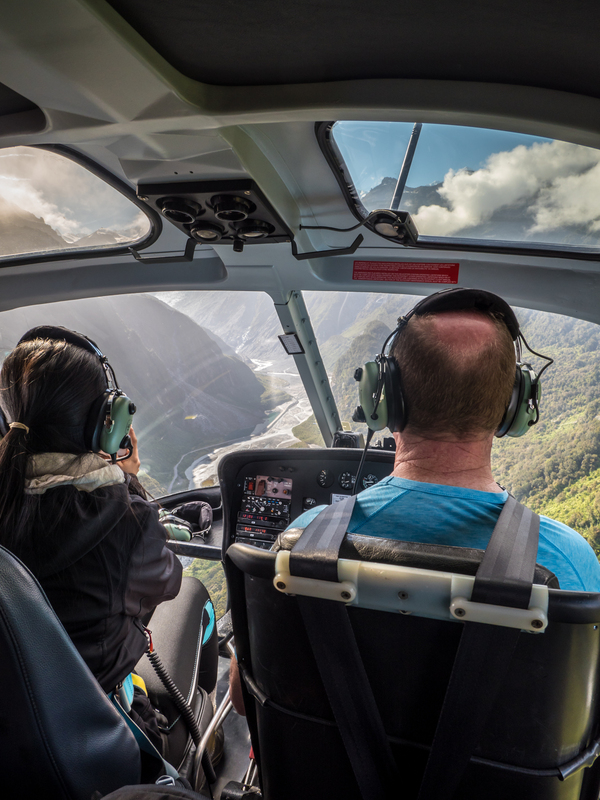 As the helicopters are flown VFR, there was a precise window in which we would still be able to fly off. (Although the alternative of spending Christmas night on the mountain was a little appealing, I’m not sure everyone agreed! ).